The following is a list of all entries from the General Updates category. The Just Add Ink artist discussion is today. All are welcome! 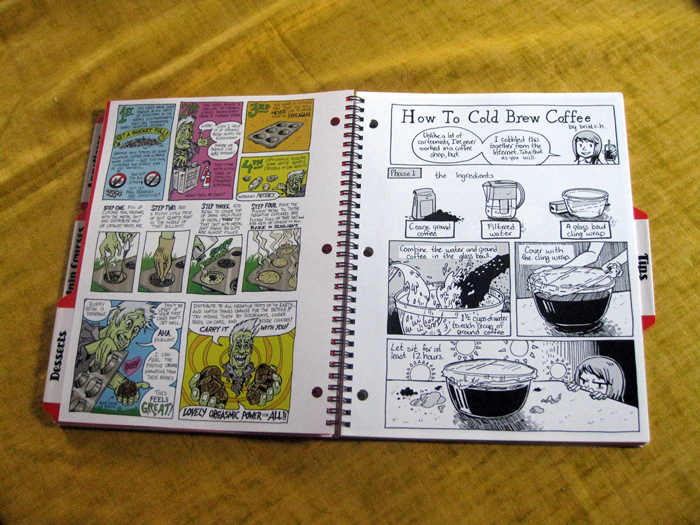 Just Add Ink: Comic Cookbooks available for purchase! What’s red, white and blue and smells bad when you cook it? 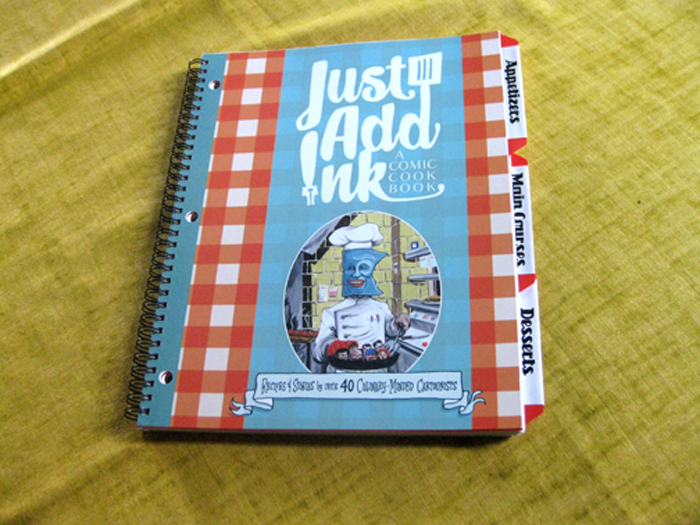 JUST ADD INK: A COMIC COOKBOOK! A limited number of printed copies are available for purchase online. Over 40 beautiful pages of wonderful recipes and stories. Makes a great gift, too! I got one for my mom… since she helped me take the books to the bindery and all. Oh, and don’t put the cookbook directly in the oven, it will smell bad if you cook it. You can purchase either a hard copy or a digital copy – info about both is below. 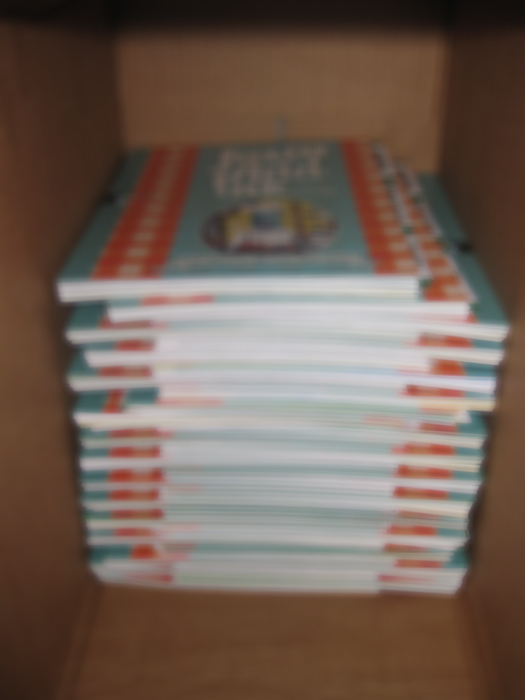 Books are shipped priority, a flat rate of $4.95. Digital copies are available on a donation basis. If you’d like to purchase a digital copy, donate any amount of your choosing. After your purchase, click the “return to Altered Esthetics” to be taken to your file. AUGUST 20, 2014 UPDATE: Copies are no longer available here, so links have been removed from this post. 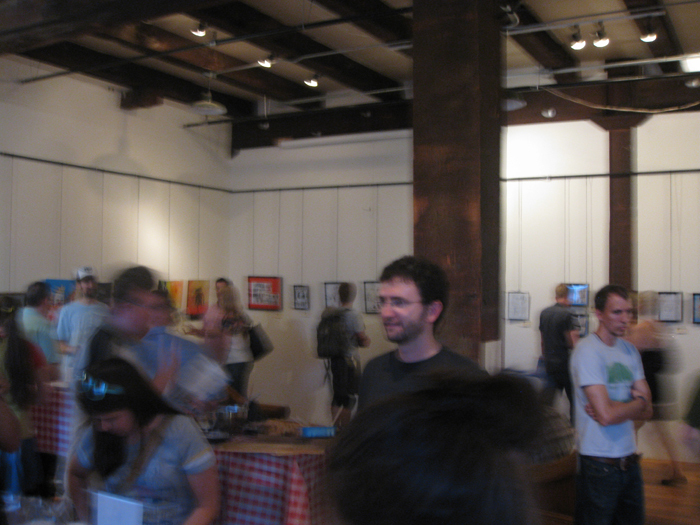 Last night’s opening was amazing, and kind of a blur. A few of the team behind the counter helped me snap a few photos… I didn’t get around to take as many as I’d like, so I’m hoping to see other people’s shots as well. We set up a little reader’s station so folks could peruse copies of the book. 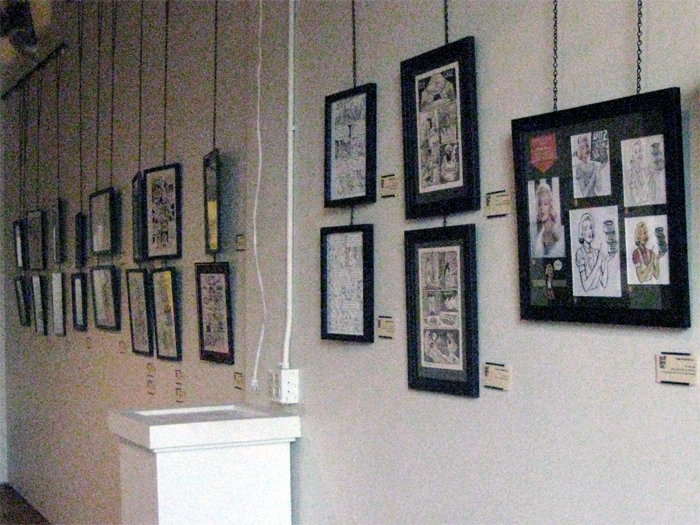 A lot of the participating artists were able to make it. 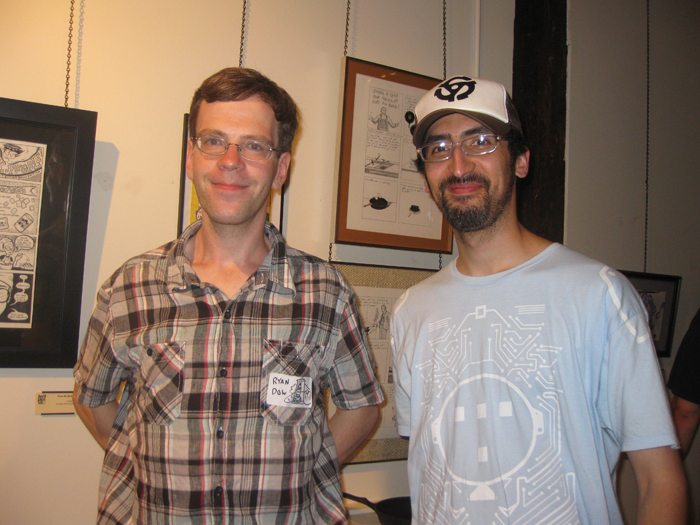 Ryan Dow and David Chen. 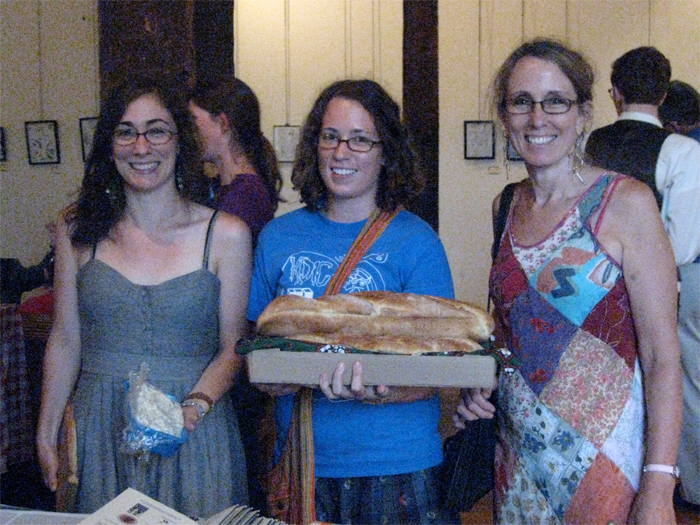 The Currier’s even came – with Sarah Currier’s famous french bread! 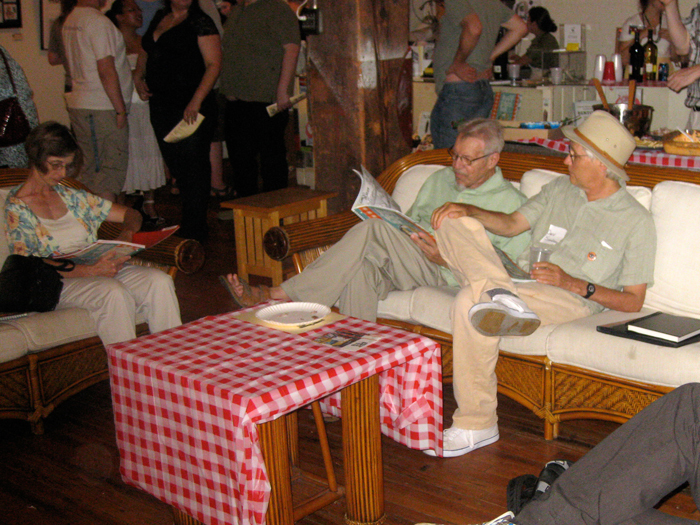 We had around 200 people in over the course of the evening and everybody had a great, great time. We sold quite a few copies of the book – people were walking out with stacks of 2 and 4, buying up copies for gifts and sharing. 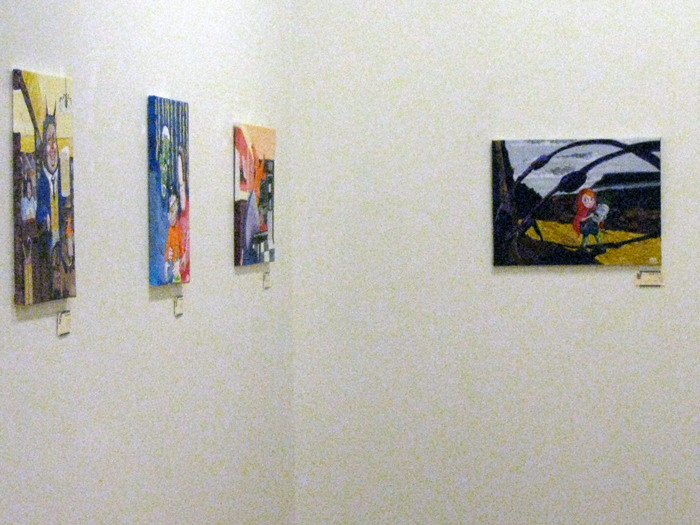 We wrapped up at the gallery around 10:30 and headed out, tired but super happy. A huge thanks to everybody that came out and made the opening night a smashing success, and big thanks to all the participating artists! 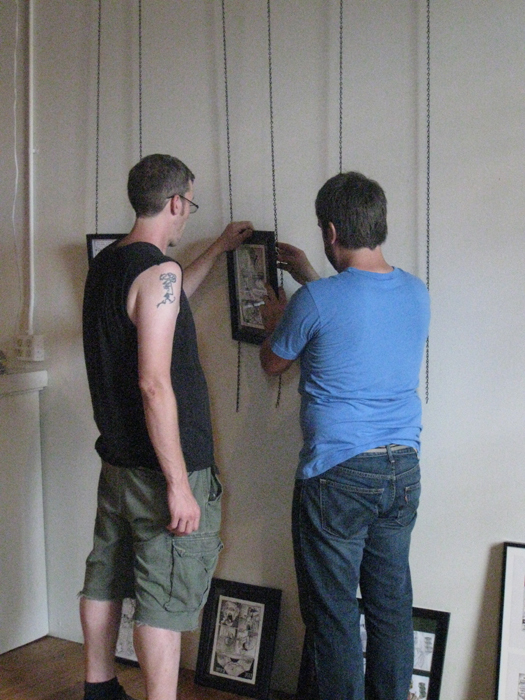 We had a lot of fun hanging the show on Tuesday! Danno and Bud showing the hanging chain who is boss. Not Tony Danza! 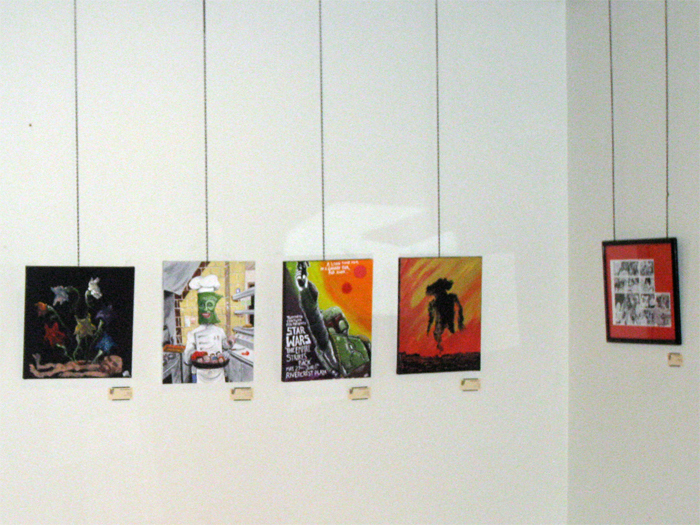 Lance Ward (featured artist) has some of his other dynamic illustration work throughout the exhibit. 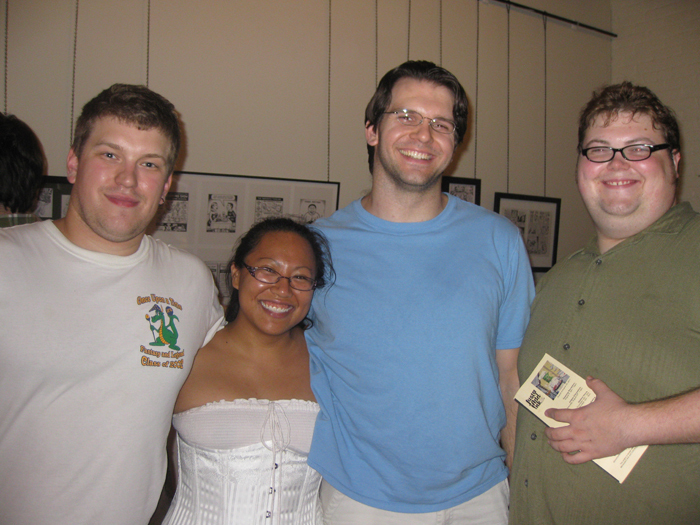 With a really, really great team the hanging went by super quickly. Aweseomeness can’t be that easy can it? It totally can. Come see the Just Add Ink show tonight and find out! 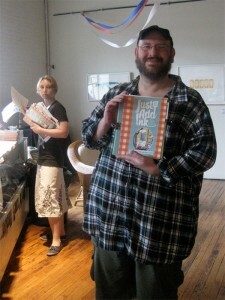 Over 60 works of art from the artists featured in the book as well as copies of Just Add Ink for sale and review. Over 40 artists… a book full of recipes, stories, and more. A labor of love, and it shows. Come see it in person and celebrate with the artists and curators! Just Add Ink opening reception August 5, 2011 at Ae! 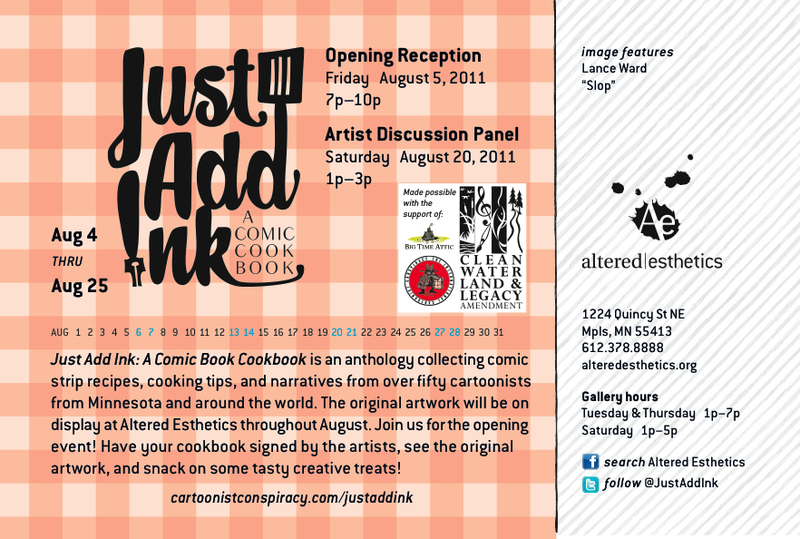 T-15 days until the opening reception for Just Add Ink!!! 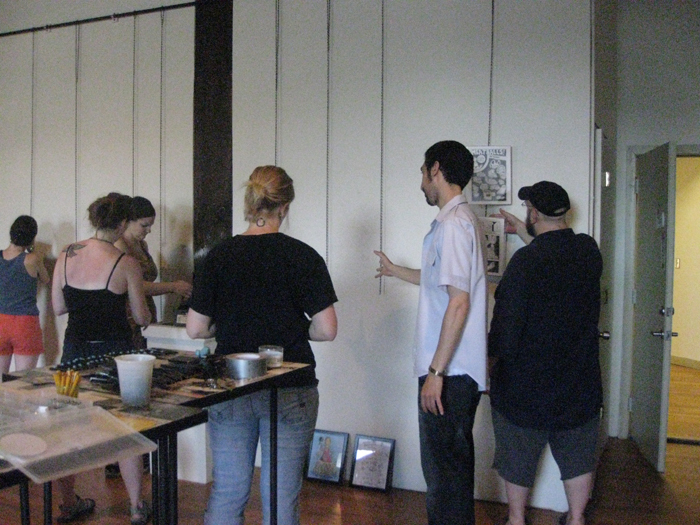 The reception event will be at Altered Esthetics Gallery on Friday, August 5th – from 7pm-10pm. The Just Add Ink team, along with a few volunteers, got together at Altered Esthetics last night to put the books together. We set up a bunch of tables and utilized the counter at Ae to spread out all the awesome submissions in book order. Lance, featured artist, poses with the very first collated book. He won’t be smiling like that in four hours when we’re still collating! 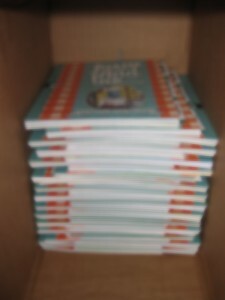 A box o’ books. Blurred in photoshop, because I’m sneaky like that. For hours we sorted, sorted – until we discovered something horrible. One of the submissions was short 100 copies. Printing companies can’t be perfect! 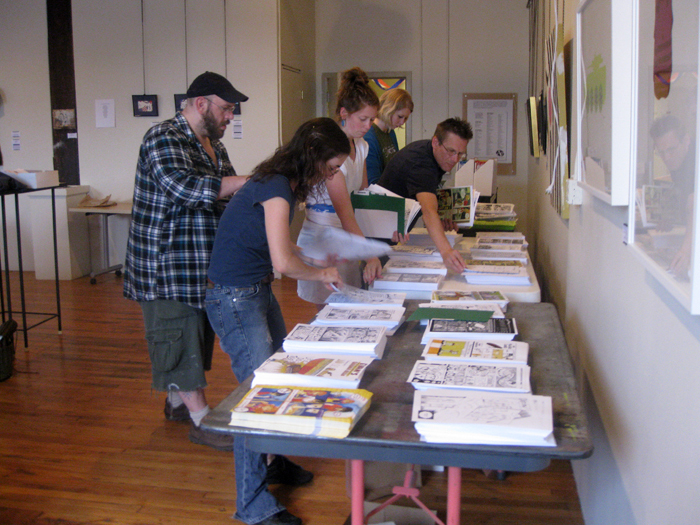 So… we did what we thought would be best: rather than lose 100 books or go through the past 200 books to pull the submission out, we raced over to the copy center to make an emergency set of copies. Thank god it was only one artist that was shorted! Note to everybody for next time: apparently that ginormous stack might not be as ginormous as you think it is – double check the page count. We finally finished at almost 10 o’clock. 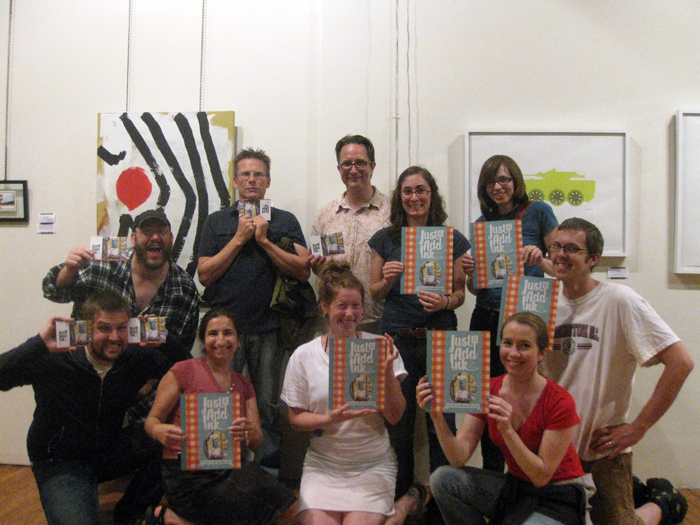 The collating team after four hours of grueling page-sorting (minus a few members that had to scoot.) Actually Lance is smiling in this picture even more. Lance, is there something you’re not telling us about your love of monotonous, repetitive organizational tasks? 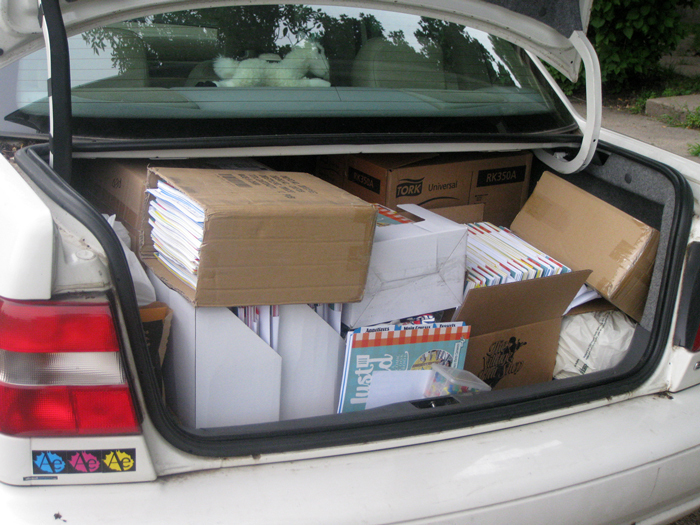 The trunk and backseat of my car are now full of books to be dropped off at the bindery today. YOWSA! Big thanks to Danno and his skillz on how to do this as efficiently as possible and to Kevin for putting so much of the initial work into getting the dividers prepped among a slew of other helpful stuffs. Thank you Anna and for getting everything pulled for us to get started sorting right away. To everybody on the collating team – thanks for making last night go smoothly and efficiently – even in the emergency! To the artists who participated – thanks for making this a truly amazing, one-of-a-kind project. Gonna change the name to Just Add Awesome. One day grace for submission dropoffs! Because June 15th (the deadline for submissions) falls on a Wednesday (when Altered Esthetics is closed) we decided to grant a one-day grace for submissions in case anybody would rather drop them off in person than send them via the postal mail. Altered Esthetics is open on Thursday June 16th from 1pm-7pm. If you need the extra day and want to save on postage, you can drop off your submission in-person during those hours. Mini-grants will still be distributed on a first-come, first-served basis. We’re also open on Tuesday from 1pm-7pm, for all you on-timers. 🙂 Dropoff at Altered Esthetics, 1224 Quincy Street NE, Minneapolis MN 55413. Creating your submission: A video guide! A cookbook for a good cause. Some of you are aware that on Sunday May 22 Minnesota was hit by a tornado, causing particularly extensive damage in the already distressed area of North Minneapolis. The City of Minneapolis has extended the state of emergency, citing a ‘long road ahead’ in terms of cleanup, rebuilding, and helping North Minneapolis families. Over the past few days I’ve made a new online acquaintance via the world of the internets, and I’ve been incredibly inspired by her experience and resilience throughout the whole tragedy. “There are SO many people that are much worse off than us – people who had NO insurance, and people whose homes were destroyed beyond repair – that we have decided NOT to make use of the Red Cross / city / etc disaster relief offerings. I’d like to see that sort of public type money going first to those who really, really need it. We had some insurance, and we’re resourceful… so we wouldn’t feel right getting aid like that. However, there’s no way we’re going to come close to covering our financial costs. So, if you’re interested in helping out financially, here are a few ways to. She goes on to say more – but you get the point. At least – I did. My orders have been placed, and if you’re interested in doing the same you can order her cookbooks online easy peasy. Both look amazing! The Spirited Baker is a celebration of liqueur as a baking ingredient and Evil Cake Overlord is a collection of ridiculously delicious cake recipes. and if you’re interested, you can read her full post here: celebrationgeneration.com. 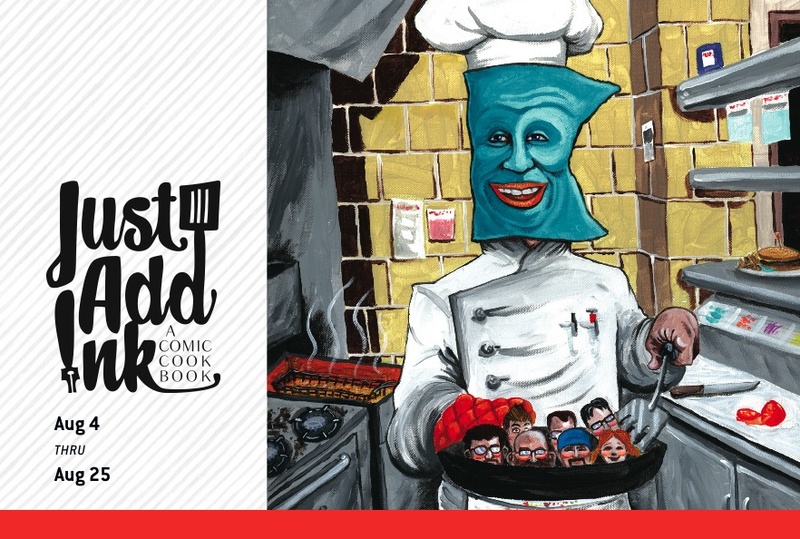 This isn’t exactly a comic cookbook, but it’s definitely a creative project I think very worth supporting, so I wanted to share the info here in addition to my own blog.